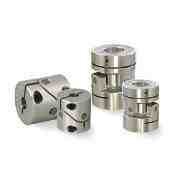 The CPU / CPE models are a pin-bushing type coupling made from an aluminum alloy. Backlash is extremely low while allowing for exceptional angular misalignment. 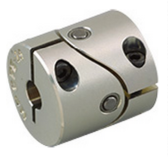 The pivot pins and bushings have a low coefficient of friction, and are maintenance free, with no need for lubricants. This coupling model also provides a damping effect from sliding at the friction surface between the pin and dry metal. The standard clamp hub makes for easy and reliable mounting. PARAFLEX models are offered in both CPU models that allow angles of deflection up to 4°and inexpensive CPE models that allow angles of deflection up to 1°.